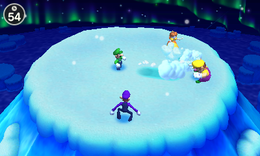 Snowball Summit is a 4-player minigame that is found during the events of the Nintendo 64 game Mario Party 3. It is also included in Mario Party: The Top 100. In this game, players have to create snowballs and try to knock each other off of a frozen summit using snowballs. 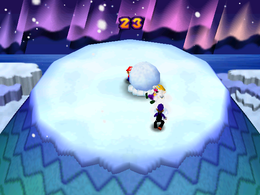 The player can build up a snowball, yet they are vulnerable to other player's snowballs, as it takes time to make one. Once done, the player is able to move the snowball around, and the more time it spends rolling, the greater the size of the snowball. Any contact sends players flying depending on the size of the snowball. Players can also fire a snowball to reach enemies far away without having to cross the entire battlefield. When two snowballs meet, though, they both cancel each other out, no matter if it is fired or being built up. In Mario Party 3, if two or more players are still on the summit when the time runs out, the minigame is considered a draw, though in Mario Party: The Top 100, any players remaining on the summit when time expires will win. Game Rules – "Press repeatedly to build a snowball. Roll it around to make it bigger, then press to roll it at your rivals." Advice – "Bigger snowballs will knock your opponents farther, but as your snowball grows, it rolls more slowly.'" Description – "Roll up a big snowball to push out your rivals!" On-screen – "Make a snowball to push out your rivals!" 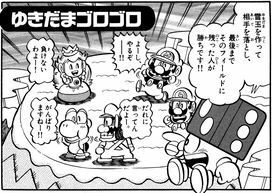 Snowball Summit also appears in volume 28 of Super Mario-Kun. Mario, Luigi, Yoshi, Princess Peach, and Wario are involved in this minigame. Yoshi makes a snowman, but Mario rolls a snowball and pushes him off the mountain just as in the game. Bowser, however, interrupts them by summoning a snowstorm by stomping on a cloud. Bowser then knocks all characters off except for Mario, who latches on the cliff using his nose. Bowser calls for help, but his two Goomba minions are sleeping. A fight between Mario and Bowser ensues, and Bowser begins by creating a huge snowball. This is a trick, however, as the two Goombas are shown pumping the snowball, revealing that the snowball is just an inflated decoy. Yoshi explodes it by poking it with a spear. Mario then pokes from the snow, being okay. This page was last edited on September 5, 2018, at 10:50.